If you have the space and budget, there’s no reason not to splurge on a hot tub. Just imagine being able to unwind with the help of warm, bubbling water at the end of a hard day. The idea sure sound enticing. And considering how most of us have stressful and demanding jobs, we can use some pampering and relaxation more often. If you’re reading this, I’m sure you already decided to invest in a spa. But as with any expensive purchase, you want to make sure that you get the perfect deal for your money. With that being said, here are some important factors to consider when choosing the right hot tub for you. When it comes to choosing the size of the hot tub, consider the location where you plan to install it. Are you looking for an indoor spa for your bathroom? In that case, you may want to look at smaller hot tubs. 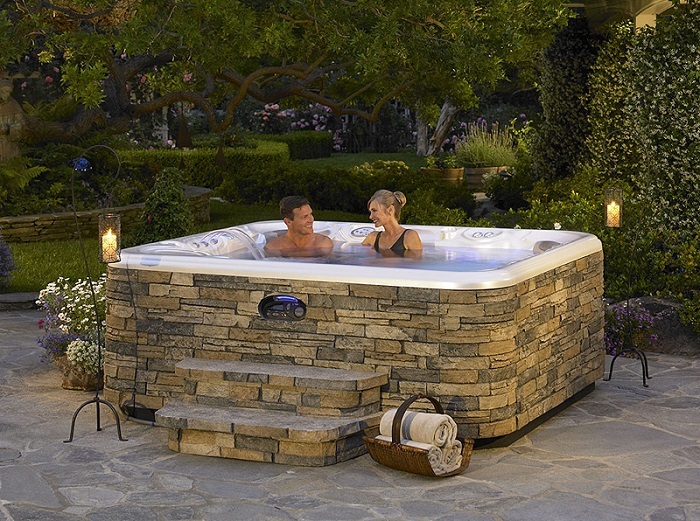 Besides being able to fit in most spaces, smaller spas built for two people are also more affordable to run and easier to maintain. On the other hand, if you need room for you, your partner and your kids or want to invite friends over to share the waters, you may want to look into larger models such as a four person hot tub. 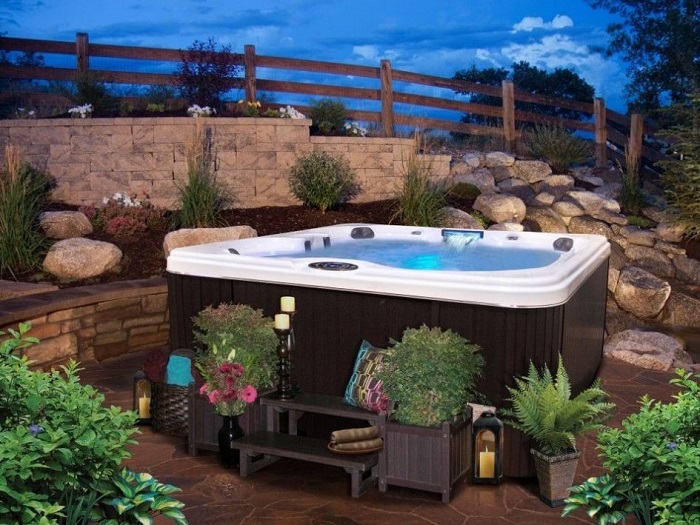 A four person hot tub is usually a great solution as it is small enough to fit in a bathroom or on a balcony, and large enough to accommodate several people. On the other hand, if you have a large enough space in your yard, you can look into 6, 7 or 8 person models or even a swim spa if you want the added benefit of being able to swim. Considering how a hot tub is an expensive purchase, you want it to last as long as possible. The material a hot tub is made of is usually what determines its lifespan. With that being said, acrylic and fibreglass models are considered as the most long-lasting options due to being very resistant to damage and fading. On the other hand, while a wooden shell may look like an attractive choice, it’s usually a bad idea as wood can warp when exposed to moisture and humidity. The purpose of a hot tub is to let yourself unwind and relax. That being said, having to clean the hot tub very often does not quite fit the idea of relaxing. While hot tubs do need some cleaning from time to time, there are some features that can make them much easier to maintain. One such feature is the special antibacterial and anti-fungal coating called “Microban”. This type of coating is 100% non-porous which makes it hard for dirt and bacteria to stick to, thus resulting in a hot tub that gets dirty less often. Additionally, make sure to pick a good filter that can prevent particles from getting caught in the water pump and clogging it. The hot tub, also called by the much fancier name – spa, is more than just your giant bathtub where you can unwind with a glass of wine or your partner, or best of all – both. In fact, hot tubs are a form of hydrotherapy which can have amazing benefits for your health. Using hydrotherapy regularly can help you relax, improve your sleep, alleviate muscle and joint paint, and improve blood circulation. Whether you’re planning to get a spa for pure indulgence or for a certain health reason, here are some steps that can help you decide which one to get. Let’s be honest, getting a hot tub is a major purchase. On average, hot tubs can range between $6000 – $30 000, depending on size and additional features. Extra features like entertainment systems and lighting are sure nice to have, but they can also significantly increase the price of the spa. Therefore, before considering deluxe models, you should know how much you can spend. Before you take your wallet out, browse all your available options. A good way to do so is to take a look at the wide range of hot tubs online and decide which features are essential for you and which are not. Even the most basic models still offer you the great benefits of hydrotherapy, if that’s what you’re looking for. But if you want a spa experience focused on entertainment, modify your budget to include the various bells and whistles that can make your spa exactly how you want it to be. There are two types of materials you can choose from: all natural wood, or sturdy fibreglass and polypropylene. If you opt for the classic beauty a wooden spa can have, be ready for some high maintenance. Wood is a material that can shrink or expand when exposed for long periods to moisture. Also, some badly made wooden spas can experience leakage. On the other hand, polypropylene and fibreglass hot tubs consist of several layers which prevent leakages. Furthermore, these hot tubs require less cleaning and maintenance. The choice of material should eventually come down to your personal taste. In the case of hot tubs – size really matters. Do you envision yourself in a cosy, little tub for two, or in a large-sized model with plenty of room for more people? Choosing a large-capacity model is a major consideration. A tub for 6 or 8 people requires plenty of maintenance and more power to run. But if you’re planning to grow your family or want to share your spa with friends, consider a model that can accommodate at least four people. But most importantly, consider whether you actually have enough space to fit a large-sized tub.